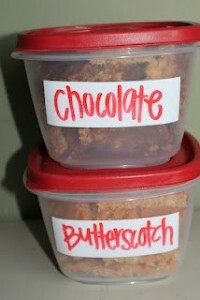 Instead of writing on Tupperware with permanent marker, check out this great way to use an erasable method! It’s easy to store your food items in them and be able to identify exactly what they are in your pantry. Head on over to Doodle Craft to find out more on this kitchen tip! What a fantastic idea! I really need to organize the pantry and I think this might help.